It seems like I've been trying to get my dressing room put back together for weeks. Probably because I have been. Actually, it's been almost a month since we moved the furniture back in there. Yikes! I'm happy to say that I can finally shut the door on the room without feeling guilty. 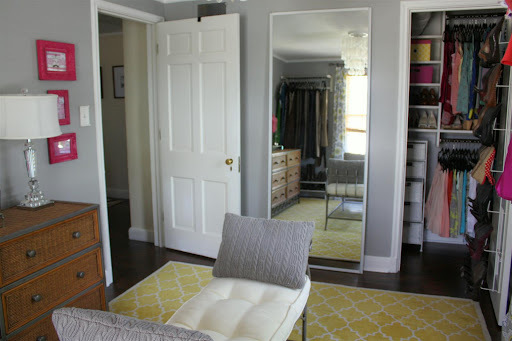 I love the dark floors with the yellow rug! I added these hot pink frames by the door because I loved the pop of pink. The shade matched my closet accents, and I thought I could put in pictures of myself in a bikini to make me feel extra bad when my pants are tight. Until then, they say HOT GOTH. Seriously, Sheffield Home? 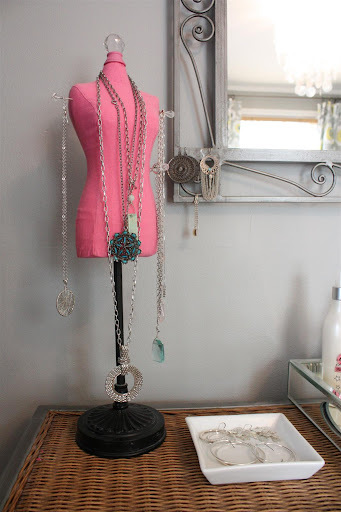 Another TJ Maxx find was this little pink Jewelry Mannequin on the dresser - which was already spied by the eagle-eyed Amanda at Hip House Girl last week. It was on mega clearance and I needed somewhere to put my necklaces that didn't involve a bulletin board, chicken wire or creativity. I don't have time for that stuff! I actually felt bad about stabbing it with the decorative pins. So, I compromised by putting two pins as 'arms' and one as a non-critical side wound. I'm such a weirdo! I also thought for a moment about spraying the base to match the pewter of the dresser and mirror, and then decided living my life was more important. Thank goodness everything is back to normal. LOL! You crack me up with living your life. The floors look great with the yellow rug! You crack me up, Sara. Am I allowed to hate you for your closet space, though? Because I do. That, and I want to come live with you. I agree, the dark floors look GREAT against your yellow rug (which I love, love, love). And your new necklace holder is perfect -- don't paint it. How jealous am I? Very. As I am sitting in my very large office, pondering should I make this a dressing room like Sara? 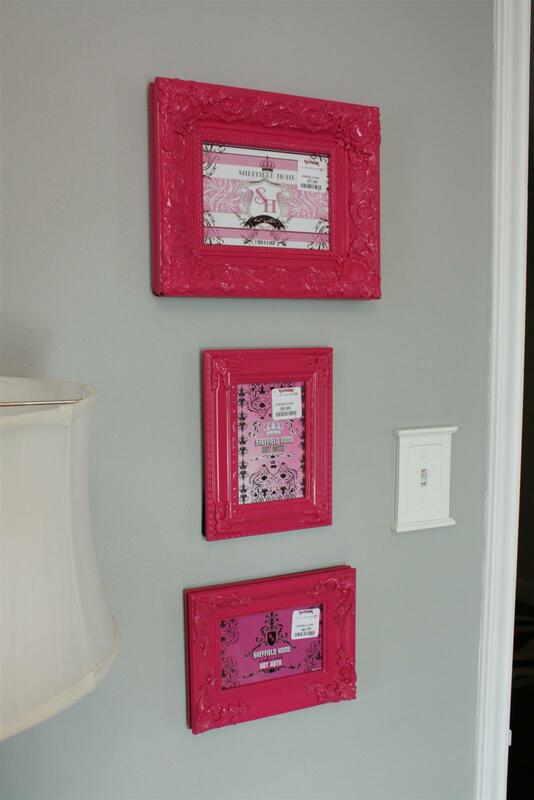 Love the pink frames! And yes, your floors look fantastic! Hahaha I totally thought it was a human-sized one! Oh man, this is really cracking me up right now. Funny thing is, I have one of those necklace mannequins too, so I should have known. And I totally want to copy your bikini photo idea, only I want to put mine on the fridge. Hahaha, you are too funny! Your dressing room looks FAB. And, like Kelly, I am totally envious of you and that amazing room. The bright pops of color really bring some brightly colored fun into the predominantly gray space, and the yellow rug is perfect. Love it all! Oh yes, and the mannequin. How could I forget that little accent? :) Love it. Don't paint it - it works just fine like it is. looks great!! I love the colors in the room so much, the pink makes me smile. I want those pillow covers, I really need to become a good knitter soon! it looks so beautiful and ORGANIZED! lovin the yellow rug! Your dressing room is simply phenomenal. You should send this re-do in to a magazine or something! Love those pops of pink and that jewelry mannequin. So nice of you to spare it from life-threatening wounds! 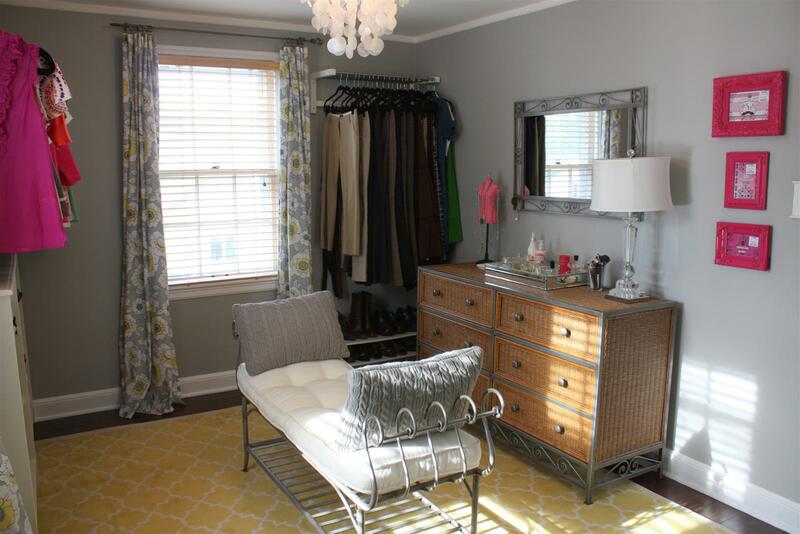 Your dressing room is amazing...I've been drooling over the gray walls and stalking the same rug on ebay! Haha I always feel bad for inanimate objects too! Love how the new floors look with everything! And your bikini picture idea is hilarious....and brilliant! 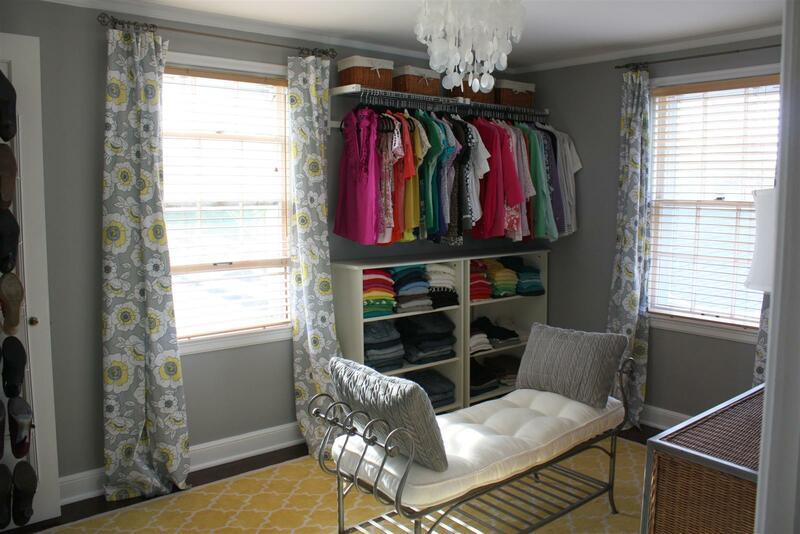 This room is the perfect girl's place! I love the color choices and just the fact that it's all yours! Love it!!!! I love this room ... couldn't you just sit in there for hours? Love all the DIY projects as well as maintaining a budget. Well done!! Oh my..that room is the most fabulous of all the fabulous rooms in the world :)seriously..i love it. and I know what you mean about taking awhile to get things put (back) together. Our dining room is still a hot mess right now and it is driving me CrAzY! We just haven't had the time to finish it...and it's most annoying because it is a room that you can't close the door to and hide it from guests. Nope it's just there..out in the open. ugh. one of these days! looks great! I love the grey you chose for the walls. and the pops of pink are fantastic! I love the pink frames!